Dino is one of this year’s six Walk for the Kitties spokeskitties. Here’s his special story. Dino and his mom Deanna were living under a woodpile when they were rescued. 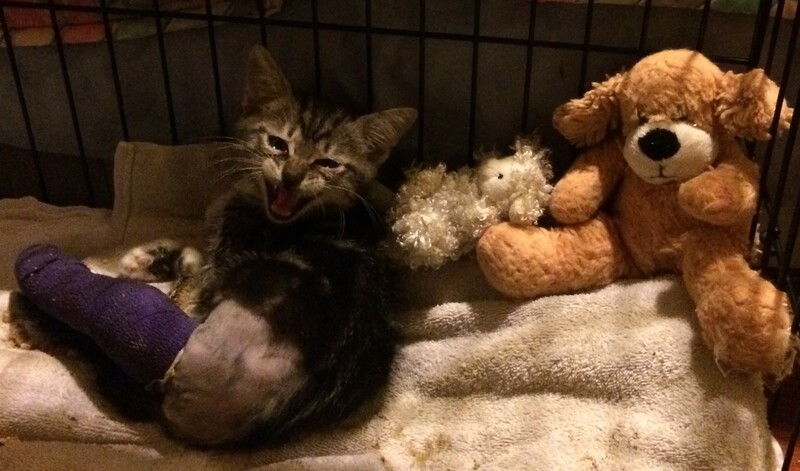 During an exam the vet discovered the little five-week old had a broken thigh bone that would require surgery. He’d been living with the injury for quite a long time and must have been in a lot of pain. Because of Dino’s young age, it was originally thought his leg would need to be amputated. But a specialist surgeon was called in and was able to save the leg by putting in a plate to fix his thighbone. For the first week after surgery Dino was able to scamper around with a cast, but once the cast came off and the leg was wrapped he was confined to bed rest. No running, no jumping, no fun! Dino was a champ though and after another check-up the surgery was considered a success. It’s now been almost two months after Dino’s surgery and he’s on the road to a full recovered. As you can see in this video, he’s getting around with no problems and his foster mom, VOKRA co-founder Karen, says he’ll soon be ready for adoption. To date, it’s cost us more than $2,000 to make sure Dino has the best life possible. And he’s just one of the many kittens with special needs we rescue ever year. 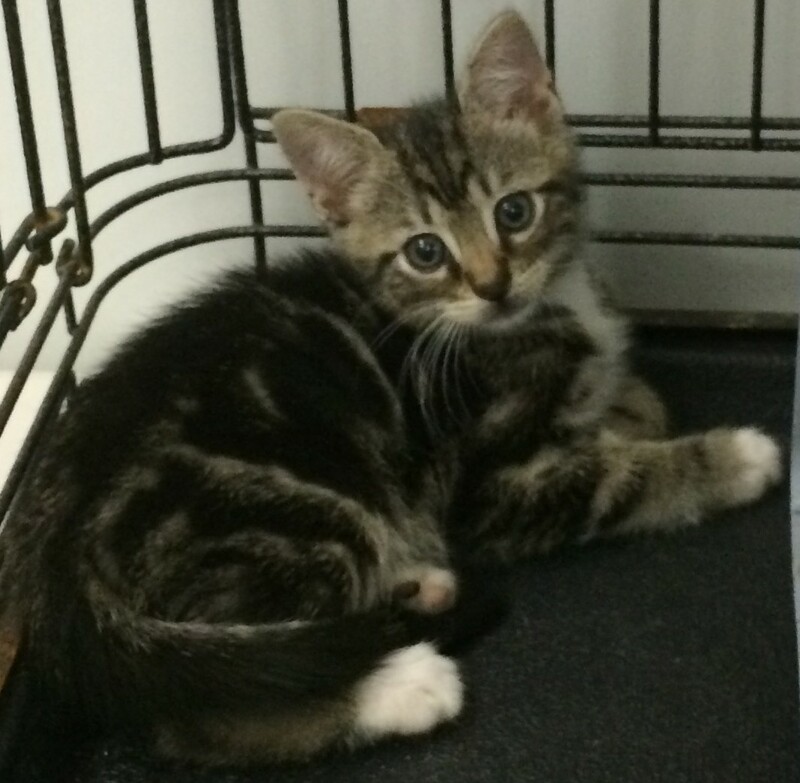 Will you be walking for Dino and all the kittens that need a little extra help? On September 13 VOKRA will be holding it’s 6th Annual Walk for the Kitties. It’s our biggest fundraiser and this year our goal is to raise $50,000. CHOOSE YOUR KITTY – Each one of our spokeskitties have a tale to tell and represent different activities we do here at VOKRA. You can read all their stories here and decide which kitty you’d like to walk for. GATHER DONATIONS – Ask your friends, family, and others to support you in walking for the kitties. The walk itself is a celebration of the support you’ve been able to gather. Learn more about how to raise funds here. WALK – Join us at Jericho Beach on September 13. Rain or Shine! CELEBRATE – Congratulate yourself on doing a good thing. Know that a cat or kitten today is receiving help that could only be supplied through your generosity. Learn more about Walk for the Kitties here. Help save kitties just by doing your back to school shopping! Purchase a gift card through us and the retailer donates to VOKRA – and you still receive full value for your card. Use the gift cards for school supplies, computers, clothing, meals, and more! You can view the full list at vokra.ca/giftcards. To purchase simply email us at vokragiftcards@gmail.com. Payment and delivery options can be arranged via email. The next order deadline is August 30 so be sure to get your order in before then!